Karl Marx had demonstrated that the collapse of capitalism is inevitable and Lenin showed that the socialist transition would begin in Russia, capitalism’s weakest link. The Bolshevik seizure of power in Russia is therefore seen by its supporters as merely the first stage of a revolutionary wave that will soon sweep the world. Unrest in Germany and elsewhere indicates working people are ripe for revolution: perhaps only the slightest push is needed for the capitalist house of cards to fall. To hasten socialist revolution, the Bolsheviks (now renamed the Russian Communist Party) call a meeting of sympathetic socialist parties in Moscow. Their aim is to replace the now largely defunct Second International of socialist parties with a new Third International, one that will be explicitly communist and which will allow the various parties to better coordinate their efforts to overthrow capitalism. And, crucially, this Communist International will be under Moscow’s control, to ensure that the affiliated parties do not slip into unsound thinking or act in ways contrary to the interests of Soviet Russia. The founding congress of the Communist International opens today. Transport difficulties and the Allied blockade of Soviet Russia mean that it is difficult for delegates to travel to Moscow; many of those present are exiles who have been living in Russia for some time. Leading Russian communists such as Kollontai, Trotsky and Lenin himself present material to the congress. Zinoviev is appointed chairman of its executive. He reports confidently: “in a year, the whole of Europe will be communist”. The Red Army has had some successes against its enemies, but Soviet Russia’s situation is still precarious. White armies and their foreign allies threaten the Bolshevik zone from without, but a more insidious problem is the shortage of food. Much of Russia’s most productive agricultural areas are outside Soviet control, while the dislocation caused by war, revolution and now civil war has disrupted the production and distribution of food; as a result, the cities are increasingly going hungry. The urban centres are the heartland of the Bolshevik regime, so food shortages there pose a mortal threat to its survival. The Bolsheviks have been confiscating the peasantry’s grain surpluses since last May, but now they go one step further, with Sovnarkom (the Soviet government) issuing a decree on prodrazvyorstka, or food apportionment. Instead of taking the farmers’ surpluses, food confiscation quotas are issued to each locality, with the quota to be seized from peasants whether they can afford to part with it or not. If the peasants’ own supplies of food are confiscated then they may starve, while famine may result if seed stocks are seized, but Lenin and his associates hope that the new grain levy will ensure that the cities at least remain adequately fed. With the defeat of Germany on the Western Front the main threat to the established order of Europe is now Bolshevism. Lenin and his Bolsheviks have taken power in Russia and overturned the prevailing order of society there, executing the royal family, seizing property and reversing traditional hierarchies. Across Europe and beyond the fear of those in power is that something similar might now happen in their own countries. Consequently their policemen are on guard for any sign of Bolshevik contagion spreading to their own disgruntled working classes. The end of fighting on the Western Front and the Middle East has freed up large numbers of Allied troops. Large stocks of war materials are no longer needed for the struggle against Germany and Turkey. Could some of these soldiers and some of this materiel be sent to aid the White armies fighting against the Bolsheviks? Allied troops have already established themselves in ports on the periphery of the former Russian Empire: Archangelsk and Murmansk in the north, Vladivostok in the far east, and Odessa, Sevastopol and Novorossiysk in the south. The Allied forces thus far deployed are too small to seriously affect the outcome of the Russian Civil War, but White leaders hope that they are just the advance guard of larger intervention forces. Allied material aid to the Whites has also been relatively modest thus far, but again, the anti-Bolshevik leaders hope that more is on its way. Trotsky‘s reorganisation of the Red Army had seen it win a number of victories but now perhaps the pendulum is swinging in the other direction. Admiral Kolchak has reinvigorated White forces in the Siberian theatre, with his troops no longer needing the backing of the Czechoslovak Legion to take on the Red Army. Today Kolchak’s men capture Perm, an industrial city in the Urals. In the fighting large numbers of Red Army troops surrender to Kolchak; they appear to have been sent into the battle without adequate training or winter clothing. 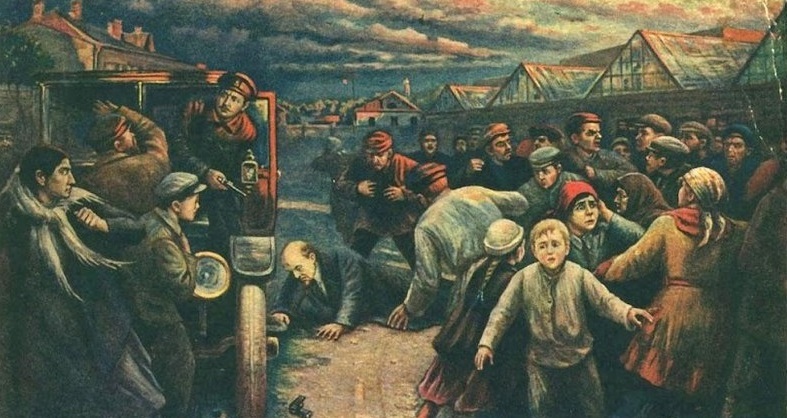 The Red Army troops appear also to be suffering from food shortages, a consequence of disorganisation in the Bolsheviks’ rear and the alienation of the peasantry by the Red Terror. This is all very promising for Kolchak, as it suggests that the Red Army might just be on the brink of disintegration. Bolshevik rule in Russia rests on shaky foundations. In Siberia the party’s writ is challenged by the Komuch government in Samara, whose Czechoslovak allies are a powerful military force. Meanwhile in southern Russia, Denikin has established himself in Novorossiisk in the Kuban region, from where his White Army represents a potent threat to Bolshevik power. But surely the Bolsheviks are secure in Moscow and Petrograd, the heartlands of the revolution? Lenin certainly thinks so when he heads off today to urge some Moscow factory workers to remain unrelenting in their defence of the revolution. While there has been some industrial unrest in the big cities, the Bolsheviks have successfully faced it down and now face a more pliant workforce. The uprising by their erstwhile allies, the Left SRs, has been crushed. So Lenin should have nothing to worry about. News of the assassination of Moisei Uritsky, Cheka commander in Petrograd, appears not to have engendered any caution on the part of the Bolshevik leader. Lenin’s nonchalance however proves almost fatal when, as he leaves the factory, a woman emerges from the crowd and produces a pistol. She fires three times at the Bolshevik and then attempts to escape. Lenin is gravely hurt; his comrades fear that his death may be imminent. His would-be assassin meanwhile is apprehended and interrogated by the Cheka. She is Fanny Kaplan, a Socialist Revolutionary, who declares to her captors that she shot Lenin because he has betrayed the Revolution. Russia is now in the grip of civil war between the Bolshevik government in Moscow and its various enemies. However the chaotic situation in the country is not merely an internal matter, as foreign powers are now beginning to intervene. This is mainly a matter for the Allies, as the Central Powers are too busy with the territories they wrested from Russia at Brest-Litovsk to actively take sides in the civil war. Allied intervention in Russia however is somewhat confused, with a lack of clear goals or a consistent approach. In the Russian Far East, Japanese and American troops have landed in Vladivostok, to secure the city for the Czechoslovak Legion. This is implicitly an anti-Bolshevik intervention, as the Czechoslovaks are fighting the Bolsheviks on behalf of the Komuch government in Samara. British forces meanwhile have established themselves in the north Russian ports of Murmansk and Archangelsk. They landed initially to secure military supplies that had been sent there to support the Russian war effort. The British were also keen to deter German or Finnish expansion in this region, which meant that there was some tacit support for their landing on the part of the Bolsheviks. Since then though there are suspicions that the British are working with anti-Bolshevik elements. In Baku British intervention is fighting to block Turkish expansion in the Caucasus region. Turkish forces have been expanding here since Russia signed the Treaty of Brest-Litovsk, seeking to recover territory lost in previous conflicts with Russia. Their attempts to advance into Georgia had put them at loggerheads with the Germans, who favour Georgian independence. It seemed briefly as though the Turco-German alliance would collapse over the issue, but instead Enver, Turkey’s war minister, backed down and redirected his men towards Azerbaijan. Following inter-communal violence in April, Baku is now largely devoid of Azeris and is under the control of the Central Caspian Dictatorship, an alliance of Armenian nationalist and various anti-Bolshevik forces that recently seized power in the city. The Dictatorship is now facing a Turkish army under the command of Nuri Pasha, Enver’s half brother. The defence of Baku is aided by an amphibious British force, which arrives today from Persia. The British are only too happy to take on the Turks, fearing that if they are victorious in Baku they will then attempt an overland march on India. Their expeditionary force is nick-named Dunsterforce, after its commander, General Lionel Dunsterville, who is reputedly the real-life model for the eponymous character in Rudyard Kipling’s Stalky & Co. The arrival of Dunsterforce at Baku proves decisive. The Turks are forced back. For now at least Baku remains a safe haven for Armenians. The military situation for the Bolsheviks is grim. The Czechoslovak Legion, allied to the anti-Bolshevik Komuch government in Samara appears to be unstoppable. Simbirsk in the Volga region has fallen to them, a target of symbolic importance as it is the birthplace of Lenin. Ekaterinburg too is now in their hands, falling to the Czechoslovaks a week after the Bolsheviks there had killed the Tsar and his family; the Czechoslovaks find no trace of the dead royals although a British officer serving with them manages to rescue Joy, the Tsarevich‘s pet dog, the only survivor of the executions. Desperate times require desperate measures. Trotsky, the war commissar, has already shocked socialist sensibilities by seeking to recruit former Tsarist officers into the Red Army. Now he goes further, ordering the mass conscription of all former officers in the hope of professionalising the Red Army’s officer corps. To avoid leftist opposition to this measure he abolishes the Red Army’s soldiers’ committees. For those Tsarist officers who find themselves in the zone controlled by the Bolsheviks, the choice is now simple: either they join the Red Army and take up arms against their former comrades now serving with Denikin and Alexeev, or they face imprisonment and other reprisals at the hands of the Bolsheviks. Further encouraging them into the Red Army’s ranks is the fact that many of these former officers are now effectively destitute as a result of the revolution. With no real choice they join the Red Army in large numbers, to the dismay of those who see their presence as symbolising a betrayal of revolutionary principles.